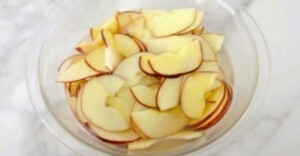 Put apple slices into medium sized bowl with water, squeeze in lemon and microwave for 3 minutes. Drain apples and set aside. 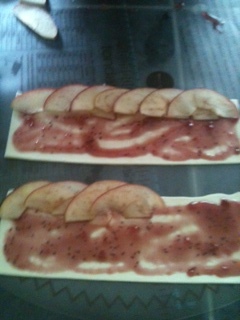 Roll out puff pastry and cut into strips about 10cm wide. Combine 3 tablespoons of jam with 1 tablespoon water and microwave 1 min to heat through. Spoon a small amount of jam over the pastry, then place apples overlapping across the top half of the pastry- see pictures dust with cinnamon. 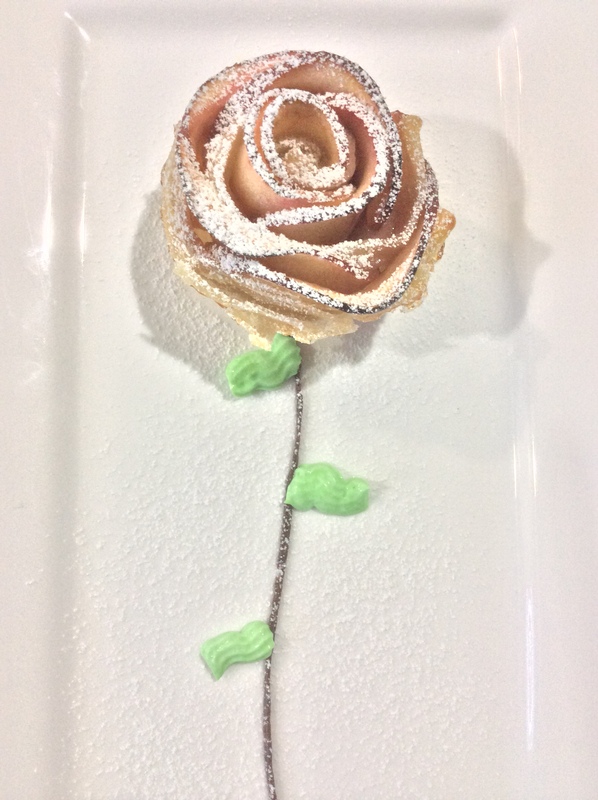 Pull up the remaining pastry to cover half the apple slices then roll up to form the “flower”. Place in silicon cup cake tray and bake at 190C for 45 minutes. Take out of tray and dust with icing sugar. Combine milk, cream and vanilla in a saucepan, and bring to a simmer. Place egg yolks and sugar in a bowl and whisk until just combines and then gradually pour hot cream mixture into the bowl and whisk to combine. Return mixture to same pan and stir over low heat until mixture reaches 83C, it will thicken enough to cat the back of a wooden spoon. Do not boil.